Last week we got a tease of a new project from SCEJ called 100. Other than a simple teaser site that had a background animation of people parachuting out of a ship there weren’t any real details on the project aside from murmurs that the team behind The Last Guy was developing the game. Besides the No More Heroes PS3/Xbox 360 announcement the latest issue of Famitsu also has our first look at 100 which is now confirmed as a PSP game. While exact details of the Famitsu article have yet to be translated one thing that is pretty easy to understand is that the game looks really good. Once again the team at SCEJ is following up Loco Roco and Patapon with yet another title that looks completely original and seems to be bursting at the seams with character. It would be nice if we had some gameplay details but the images do hint at some sort of climbing mechanics along with the hinted parachuting aspect. Yeah nen weiteres Anti Mainstream Game von Sony. Der Titel 100 ist ein bisschen falsch. 万 (man) bedeutet 10.000 und 100万(man) sind somit 1.000.000 . Das Zerstückeln von 1Mio. Tonnen. Aber wahrscheinlich wird der Titel wohl für die lokalisierte Fassung komplett verändert. naja las nur die Meldungen als 100. Lassen wa erstmal so bis der offiziele Name da ist. Von der Grafik her erinnert mich das an Scribblenauts DS (oder wie des geschrieben wird). Bereits seit einiger Zeit berichten wir über den japanischen Titel 100 Man Ton no BaraBara. 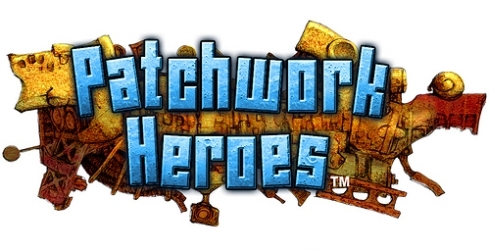 Es war nur eine Frage der Zeit, bis Sony das Spiel auch für den Westen ankündigte - doch dass der Titel mit dem Namen Patchwork Heroes bereits im Frühjahr bei uns erscheinen soll, ist dann doch eine kleine Überraschung. Das Spiel erscheint allerdings nur im Playstation Store. Im japanischen Store gibt es jetzt eine Demo dazu zum downloaden 15MB.